If you haven't checked out the Celestia Scripts at in the ESA VMC archive, then do so now. Each image archive comes with a Celestia Script to help you orient yourself with respect to Mars. The scripts do require Celestia 1.5 or better to run (they crashed my old Celestia 1.4.1), and DON'T rename the .celx extension to .cel. If you do that the script won't run (yes, I'm an idiot, yes, I should read instructions first). The scripts are somewhat slow, it takes a minute for the script to load and run on my system. 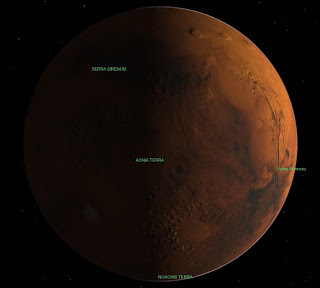 You will need a map of Mars (like Google Mars) to get more feature names. At the top (west) of the image is the Tharsis region, and the mountain visible is Arisa mons, Vallis Marinensis is lost in the glare of the limb. The big bright patch at the bottom is the crater Argyre, with Galle crater at the bottom. I still don't know the big crater in the middles name yet. Check out my images on the ESA VMC webcam site! While you are there, check out the images from Riding with Robots. 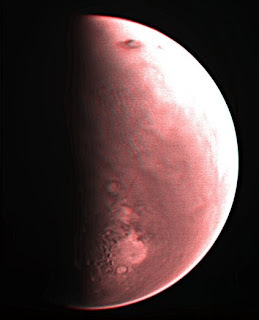 Here's another animation done from the ESA Mars Express VMC webcam images. I did something different this time, instead of trying to animate Mars's rotation during the day, I animated successive days at (roughly) the same time, to give an indication of Mars Express's orbit around Mars (so Mars appears to rotate North-South rather than East West). This worked pretty well, I think. The animation runs from 28-07-08 to 16-08-08. Some bits are jerky as there are couple of sections where chunks are missing (the last sequences are 8-8, 12-8, and 16-8, so there are no contiguous frames there), but otherwise you can see sections of Martian territory moving quite well. The AVI isn't too flash, I can't align the Mars images in ImageJ still. However, here is an aligned animated GIF (1Mb download) made in The GIMP (for details of image handling see this post) that is full size and rotates smoothly. Another clear night, I got out the binoculars at astronomical twilight and scanned for comet 2008 A1 McNaught. Found it right away, it's a small fuzzy dot, and I estimate its magnitude to be around 6.7-6.6. Sadly, a whole house of drawing obsessed people, I could not find one pencil with a point, or a sharpener (my special astrosketching pencil has gone awol) so no sketch. McNaught is moving fast, so this should be fun to watch over the next few days. Comet A1 McNaught as seen facing south an hour and a half after Sunset form the southern hemisphere (click to enlarge for a printable chart). 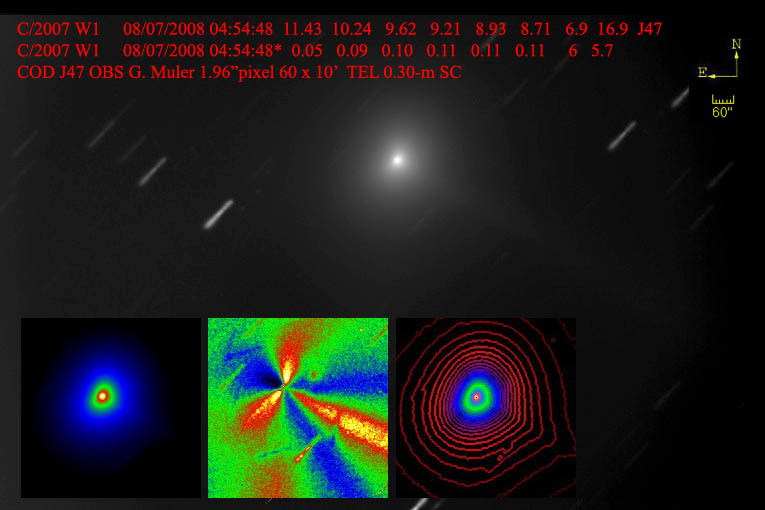 Comet A1 McNaught will never be as bright as its famous predecessor, but it is considerably brighter than what it was expected to be at this stage (Magnitude 6 vs magnitude 8). It will only be a fuzzy blob in binoculars and telescope, and people at dark-sky sites will just be able to see it as a fuzzy dot, but it will be our fuzzy dot. A nice image from Comet Al, in suburban Melbourne. How Soon After Sunset can You See Jupiter? 11 minutes .... before sunset! Yes, before Sunset. Mind you, it took me a while to set this up, but over the past few days the horizon has been finally clear. I was able to see Jupiter clearly 10 minutes after sunset, and I lined up a post with a pointy bit on it as a reference point (the point seems to help, having a post like object very close to where the planet, be it Jupiter or Venus, should appear makes it very much easier to find). The next day I was able to look earlier (due to a lack of clouds), and saw Jupiter clearly 4 minutes after Sunset. I used this view to refine my viewing post location. By making sure my outlook was a fixed number of paces form the post, and making sure I was facing the right orientation by lining up a couple of landmarks, then carefully counting the number of handspans from the top of the post to Jupiter, I prepared for my "daylight Jupiter" assault. So this afternoon everything was perfect, clear horizon and no clouds at all. I positioned myself at the observing point, lined up my post and "bang", there was Jupiter. A full 11 minutes before Sunset. I was impressed, I expected to have to wait a bit longer, but Jupiter was quite clear (so long as I had it in sight of my referents, if I move to a large patch of sky with no reference objects it disappeared). It also helped that although the Sun had not set, it was only 2 degrees above the horizon, and hidden by trees and houses, and Jupiter was almost on the other side of the sky from the Sun, where the sky was relatively dark (The Jupiter image above was taken 10 minutes after Sunset, the automatic exposure on the Olympus mu 300 overbrightens the sky washing the planet out if taken earlier). So what is the earliest you can see Jupiter in the daytime with the unaided eye? I found an article from 1917 that says you can see Jupiter only when the Sun is 5 degrees or less above the horizon. The Sun is 5 degrees above the horizon around 30 minutes before Sunset now at my location (and Jupiter 43 degrees above the horizon). So I will have a go at it on the weekend if the weather is kind. I've had a look around for other reports of Jupiter seen unaided, but haven't seen any that are not telescopic (see images here) or binocular views (see my report here of trying to see Jupiter in daylight back in 2005). A good aid to seeing planets in the daylight is the Moon. The Moon is quite visible in daylight when it is more than 2 days old, and once you have the Moon in sight locating the planet is easier. The next good daytime Moon encounter for Jupiter is 7 October when Jupiter is one degree north of the Moon (around one fingerwith, so very easy to locate), on this date the Sun is 5 degrees above the horizon at 5:50 pm. The next good Moon - Venus encounter in Daylight is 1 November when Venus is two degrees from the Moon (earlier than this the Moon is too far away or too thin to be easily seen in daylight). So why not have a go at seeing Jupiter in the daylight? How far from Sunset can you get and still see it? I have also done an animation of Mars rotating. This isn't particularly good, as Mars went partly off camera during the imaging sequence, and I couldn't get a good run of images. Still, it does show what can be done. I used the sharpened images from above, and manually aligned them using the "difference" layer function in the GIMP, then used the GIMP animation function on the aligned layers. Now if I could just get rid of those pesky artefacts. UPDATE: Check out my images on the ESA VMC webcam site! While you are there, check out the images from Riding with Robots. Via Tom's Astroblog. The controllers of Mars Express have reactivated the The Visual Monitoring Camera (VMC, which is basically a webcam). Originally the VMC was to monitor the separation of the Beagle Lander from the Orbiter, but it is able to give unique, wide field views of Mars. Students, teachers, scientists, photographers and the general public are invited to help us process the images, remove artefacts, increase sharpness and interpret what the images show. And if you have success, send us a copy - we'll publish the best submissions right here in the VMC site! You can get the images from here, and they come with Celestia scripts that allow you to orient yourself. However, the Celestia scripts do not work with the version 1.4.1 that I have. Pay close attention to the fact that the images are supplied as RAW files, not all image processing systems can load them. ImageJ can import them, but remember to type in the image size as 640x 480 (the default is 512x512 which messes the image up). Up the top left is a raw image from 08-08-08 (click to enlarge), to the right is a processed image. I first imported the image into ImageJ, converted it to BMP format, then imported the BMP into Registax and applied a wavelet correction of 10 in the 5:1 layer, and 30 in the 6:1 layer directly on the single image. Messing with the earlier layers just ends up a mess. So far I have not been able to get rid of the substantial artefacts that occur in the images (the worst artefact is masked by the bright limb of Mars in the above image). Trying to make minimum stacks or doing frame subtraction has not worked. I need a darkfield of some sort, but with bright Mars in the frame I have no idea how to make one. Stacking images has not worked either, the images are too soft focus for the automatic stacking algorithm to work (in either Registax of ImageJ), and manual stacking has been painful. I may have to process individual images to get good contrast then stack them. Still, it is well worth having a go. You might be able to create something like this animation of Mars rotating. Now that would be well worth it. Update: See my next post, where I have made a stereo image and a rotating animation. Carnival of Space #68 is here. Carnival of Space #68 is now available at CrowlSpace. The theme this week is that space travel will not be easy. There is anti-matter rocketry, not-so-alien signals from the galactic centre, why you can't use telescopes to find Moon Landers, smells in space, novel Mars sample return and Narnia Mars (seriously, check this one out, it's great). So crawl on over and have a read. About 3 minutes before Sunset. As I said, you can see Venus in daylight, so with the sun behind the meagre rise that I like to call the hill, and a little cloud masking the sky glow, and using the power pole that I have been sighting Venus off for the past few days as a reference, finding Venus was easy. Jupiter was visible 10 minutes after Sunset, but it was probably visible earlier, as the eastern sky was basically blotted out by cloud until then. Also, as the eastern sky is darker than the western sky at sunset, Jupiter should be visible earlier. There should be some sort of formula that relates sky brightness to time after sunset, that way you could calculate when a planet or star would appear based on their brightness. However, my current web searches have not found one. I can't even get a figure for daytime sky brightness that I can relate to magnitude. If anyone knows one, please let me know. When can you first see Venus? How soon after Sunset can you see Venus? Jupiter? Mercury? Actually, this is a bit of a trick question, as you can see Venus in daylight (although don't try now, Venus is still a bit too close to the Sun for safety), so theoretically you should be able to see Venus immediately after Sunset. But you have to know where to look and be prepared to stare at blankness a lot. So, if you were to look at the sky and see Venus comfortably, when should you look? Well, I looked 10 minutes after Sunset today, and I saw Venus easily (well, I did know where to look). About 15 minutes after Sunset I could just see Mercury with averted vision. By 20 minutes after Sunset, when I took the leftmost image, Mercury was readily visible (in the image, you can just see Mercury if you click on it and enlarge it). Another 5 minutes later, Venus and mercury were easily visible, and Mars was now visible too (you can see it in the right hand image which was taken 5 minutes after the left hand image, click to enlarge as always). 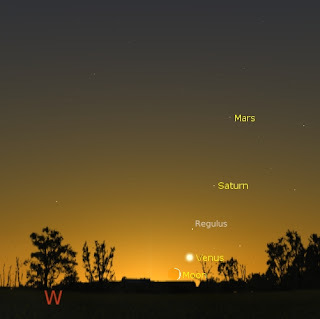 Civil twilight occurs 25 minutes after Sunset, so if you wait until then, Venus, Mercury and Mars will be easily visible. I didn't check out Jupiter, but Since Venus is magnitude -3.9, Jupiter -2.6, Mercury -0.2 and Mars 1.7, I suspect Jupiter would be visible around 10 minutes after Sunset. I'll check it out tomorrow if cloud lets me. The second of a free, six part lecture series free public seminars on climate change being given at Adelaide University. The seminar "Can we distinguish between natural and human- induced climate change?" will be from 5:30pm to 7:00pm, Friday 22 August, Lecture Theatre 102, Napier Building, North Terrace Campus, University of Adelaide. Do you ever think about how you walk? Do you walk head down, looking at the footpath ahead of you, possibly thinking about work, or what's for tea, or why there is more matter than anti-matter. Do you ever look up and see the sky in your day to day perambulations. I thought of this today as I got off the train and ambled home, I looked up, and there was Venus gleaming in a purpling sky flecked with clouds, only 15 minutes after sunset. It only took me a moment to see it. But I'm used to looking UP. Yesterday I tried to point Venus out to my neighbour, it should have been easy, as Venus was right next to a power pole, but he couldn't see it. Yet this morning he told me that a few moments later, as he headed up the street to his house, Venus suddenly "popped" into view. If we hadn't gone through the effort of looking together, would he have seen it at all? We are so used to not seeing the sky, walking looking at the road ahead of us, or sitting in buses or trains, driving cars, that sometimes the only sky we see is a brief slice as we shuttle from our dwellings to work or shops. We can become so divorced from the natural environment we don't know what it is like! Earlier this week I had a conversation with one of my colleagues, a very bright academic, who had no idea that you could see the planets without a telescope (as points of light only, but he didn't realise you could see even that). Recently Stuart relayed the story of someone who couldn't even recognise the Moon. We need to look up, to become familiar with the sky again. There are wonders there nearly every day, the effect of light in the sky, the ever changing patterns of cloud and their colours, as well of the pinpricks of stars and planets as they emerge into the twilight. So next time you are coming home from work, or shopping, or taking the kids to sport. Look UP, who knows what you might see? How Good Will the Leonids be this Year? The Perseids were very nice this year (see this nice picture), what about the iconic Leonids? For the past few years ZHR's for the Leonids have been around 15-20, not very exciting. However, there have been some interesting predictions for 2008. 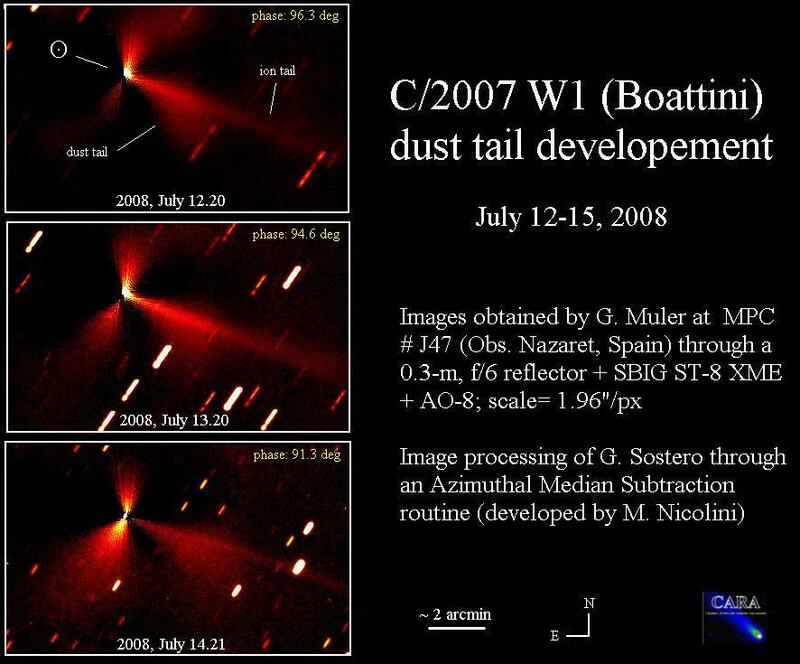 This one suggests that there will be a decent couple of dust trail encounters that will give some decent meteor rates. ZHR prediction is a tricky art, but at least one encounter may have ZHR rates around 100 meteors per hour. The problem for us Australians is that this occurs around 11:30 am, during daylight on the 18th. As the Leonid peaks are fairly sharp, we won't get to see much. The second trail occurs on the 19th around 7:30 am in Australia as well (more like 5:30 in WA, so they might see something). Given that the Moon is only just past full, and will significantly degrade meteor spotting, it looks like the Leonids will be somewhat disappointing this year as seen from Australia. AS well as stars, planets and stuff, I keep an eye out for other sky stuff, and cool effects ofg light and shade. Here is a "rainbow" I caught on the floor of Adelaide Central Railway Station, when the rising Sun caught the edge of the glass doors. As if to make up for the cloud covering the Lunar Eclipse this morning, this evening was mostly clear. The line up of Saturn, Mercury, Venus and Mars was clear, with Jupiter in the east making all the 5 planets visible in one go. You will need to click on the images and see them in all their "glory". Despite being relatively easy to see as it played tag with the clouds, Saturn is very difficult to see on the first image (compressing the image so that you could see all the planets in the line up made Saturn very dim). So you may want to look at the close-up down below, this gives you a better feel for the triple. As with the first image, click on this one to enlarge it. Iwas was able to watch for a decent amount of time, with the planets and stars becoming clearer in the purpling dusk, very beautiful. 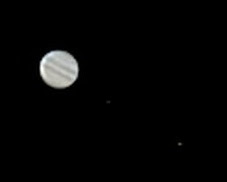 I also took an image of Jupiter (see below). Jupiter is the obviously brightest object in this image, just below the "Teapot" of Sagittarius (click on the image to enlarge it to see the "Teapot" more clearly). At the top of the image is the tail of the Scorpion. A while ago I gave notice of a seminar "Is the Earth really warming?" 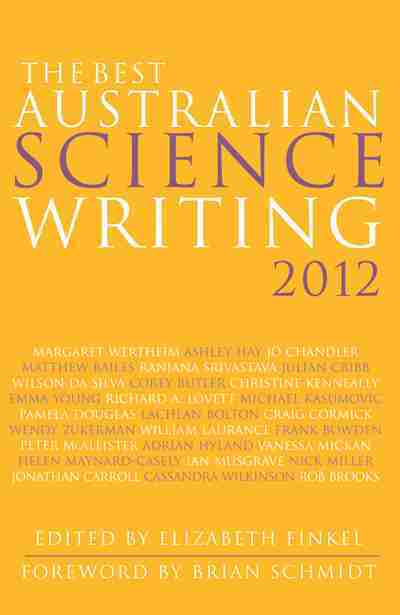 on Friday 8 August, at University of Adelaide. You can get podcasts of the seminar in three parts (Part 1, Part 2 and Part 3) as well as PDFs of the presentations (talk 1, talk 2) , over that the blog of Barry Brooks, Sir Hubert Wilkins Chair of Climate Change at the University of Adelaide, Brave New Climate. As well, you can subscribe to podcasts at bravenewclimate.com/feed or go to adelaide.edu.au/climatechange for details about this 6-part lecture series. Do drop in on Brave New Climate, it has very interesting articles for anyone interested in the actual science of global warming and climate change. When I went to bed Saturday night (after seeing The Clone Wars with family, not too bad it was), the sky was clear, the Moon bright. So typically when I got up at 4:30 am the sky was clouded over in the west, with a faint glow to indicate where the Moon was. The eastern horizon was frustratingly clear. At 5:00 am you could see the Moon occasionally flash between clouds, but not enough to really see the progress of the eclipse. Then at around 5:45 a large hole in the cloud came over, the Moon itself was still under cloud, but the cloud was thin enough you could see the Moon clearly, and the large bite taken out of it. By this time the Moon was so low that my equipment couldn't image it where the was set up. By the time I moved the scope, really thick cloud came over, and that was the end of my observations. Still, at least I got to see a bit of the eclipse, there are worse ways to spend your mornings. Carnival of Space #51 is here. Carnival of Space #51 is now launched at Next Generation. Its theme is Planets, Rockets, Books and Olympic Torches. From Mars to Enceladus and beyond, ignite your boosters and rocket on over. The partially eclipsed Moon as seen from Adelaide at 6:20 am on Sunday 17 August. On the morning of Sunday the 17th, we have a partial Lunar eclipse. Yes, I know that it will be horribly cold in the morning, but even though partial, and interrupted by twilight, the eclipse will be rather nice. People in WA will have the best views of this, but everyone will see the Moon enter the darkest part of Earth's shadow and see at least 50% of the Moon covered. In WA the eclipse starts (ie when the Moon enters the darkest part of Earth's shadow) at 3:35 am, in central states it starts at 5:00 am and in the eastern states it starts at 5:35 am. 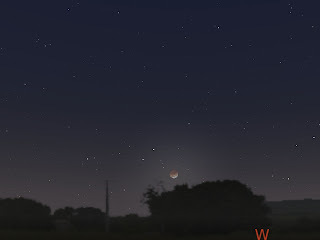 Local lunar mid-eclipse rimes (when the Moon is as ark as it will get around 85% covered) for WA is 5:10 am, central locations 6:40 am and east coast locations is 7:10 am. While you are waiting, on the early evening of the 15th and 16th, Mercury and Saturn will pass each other. Then Venus and Mercury catch up with each other over the 18th to 20th. So keep an eye on the early evening sky as well, there will be lots to see (if the weather doesn't mess us up that is). 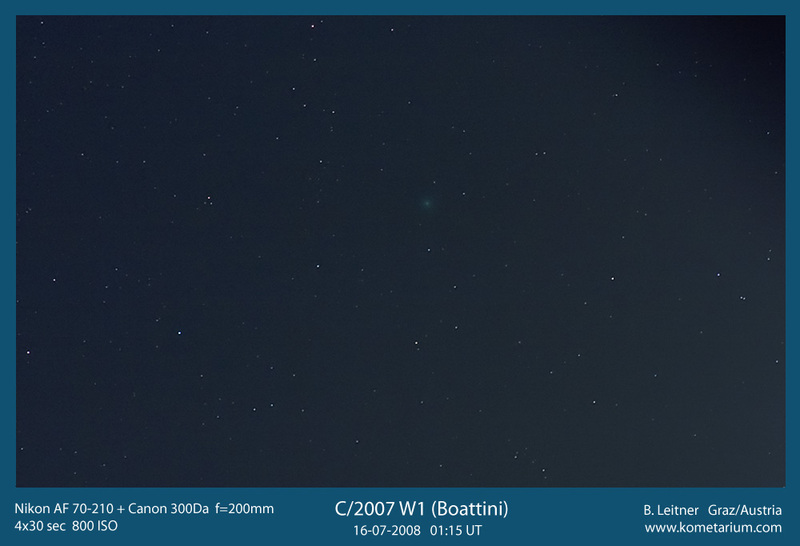 With all the rain and other stuff going on, Comet C/2007 W1 Boattini dropped of the radar after I had a few quick early morning observations. Boattini has faded to where on[y people with serious scopes can see it, but I'd like to post links to some mice images people have made over the past month or so. 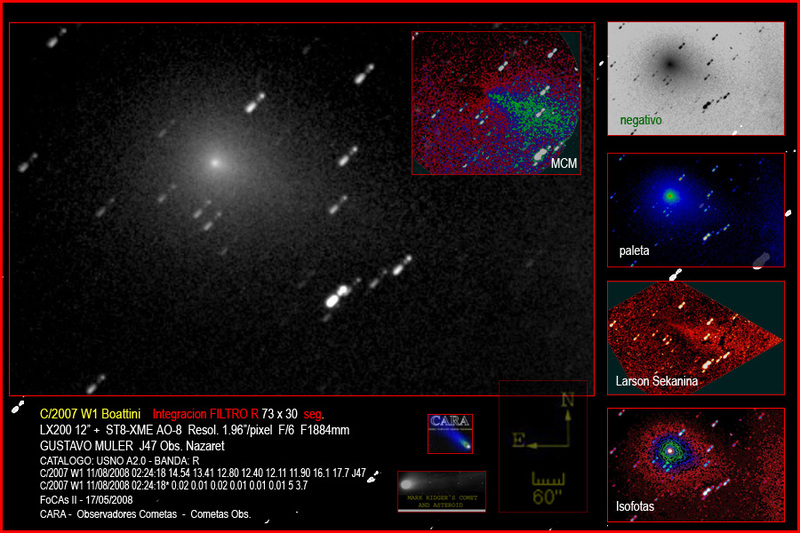 This image from John Drummond's Possum Observatory is exquisite, a nice image from Michael Mattizi, another nice one showing interesting coma structure from Mile Holloway. 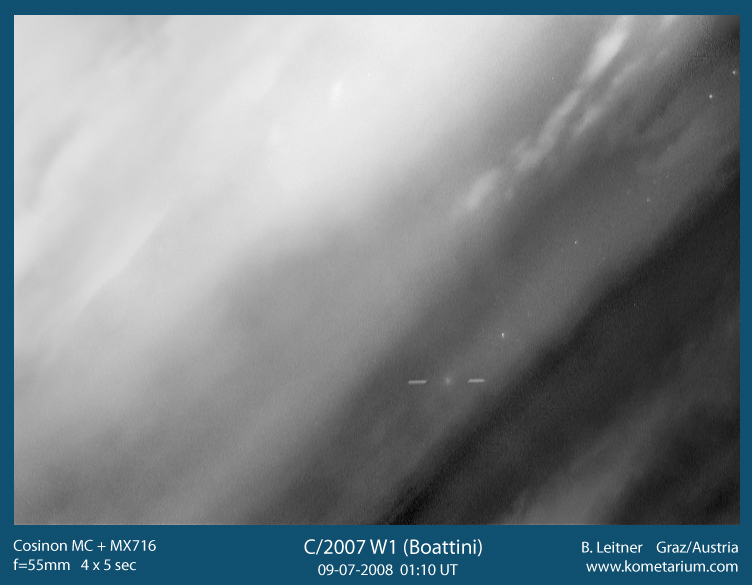 Giovanni Sostero has some nice analysis of his image, and here is an unusual image from Burkhard Leitner of Boattini in the clouds. 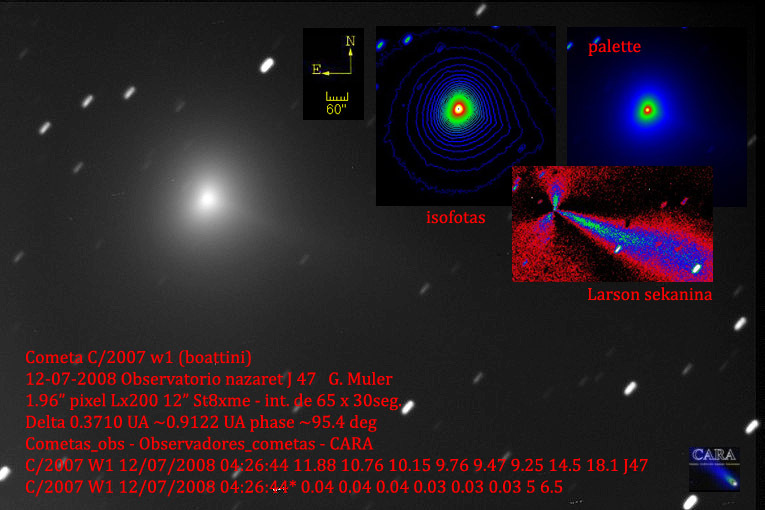 Gustavo Muler has a nice image of the coma (here as well and dust tail development here), and Martin Gembec imaged the comet at twilight. Another nice image from Burkhard Leitner, as well as this one from Raffa Ferrando and an animation as well. Finally, this image from a few nights ago. What is this thing called ZHR? I didn't see any Perseids, here is the reason why. Mist. Not thick Orgulous mist but mist just the same. The tree up the end is the tree that features in a lot of my shots. Not that I would have seen much anyway, although the Perseids are a good shower, with a ZHR of 100, from where I am there is not much Z in the ZHR. What is the ZHR anyway. ZHR stands for Zenithal Hourly Rate. This is the theoretical number of meteors you could see if you have normal eyesight, and are observing in a dark location away from city lights, the area you are observing is complete free of cloud or other obstacles, and if the meteor shower is occurring directly overhead. Now my eyesight isn't too bad, I'm not too far from the city, but these nights, when the sky isn't covered by cloud or fog, the sky is achingly clear and you can see the Milky Way with its dust lanes clearly. Not as spectacular as in the country, but still pretty decent. The killer is the Zenith bit. ZHR's are calculated as if the meteor showers were happening overhead. Dead overhead, the sky is more transparent, as you look towards the horizon you have too look through more atmosphere, and there is more dust and junk in the atmosphere lower down as well, so you will miss the dimmer meteors. Also, closer to the horizon, there is more of a chance you will miss meteors that will be start their burn behind things cluttering up the horizon (like hills, trees, neighbour's rooves etc) . For example, if the radiant (the apparent spot in the sky where the meteors can be traced back to) is 30 degrees above the horizon (that's about 5 hand spans above the horizon), then you will see half as many meteors than if the radiant was at the zenith. Now where I am, the Perseid radiant is just below the horizon, so automatically I'll lose about half the meteors, as they will be below my horizon. And so low to the horizon, all but the brightest will be lost in the murk, so I'd probably see around 1/10 the meteors you would see at the zenith. With the Perseids expected to be around a ZHR of 100, the best I could expect to see would be around 5 meteors an hour, shooting up from the horizon (even then that is an exaggeration, as I have left out other factors). People to the north of me will see more, but only in places as far north as Darwin will see something like the European or US observers will. Still, one or two meteors would be a nice start to the day. It does look like the Perseids are on track for a 100 ZHR, and here's an image from someone who saw a lot of meteors during the night. The clouds finally parted, and I was able to see the next stage in the lineup. Venus is next to Saturn, with Mercury just below (just about to go behind the roof). Out of shot (otherwise you couldn't see Saturn or Mercury with the image compression) is Mars just above these, and over on the other side of the sky was the Moon and Jupiter. All the Classic planets together, Yah!. The image is a bit lousy as the sky was quite light (click to enlarge, and you may still have to peer closely to pick up Saturn and Mercury). Even thought the planets, even Mercury, were quite easily visible to the unaided eye, the camera gets quite overwhelmed with background light this early. So why didn't I wait a little longer and go down the beach to take images like the other nights? The Bettdeckererschnappenderweisle made her famous Pea and Ham soup! No way was I letting that get cold! Tomorrow Saturn is still close to Venus, so you have another chance to see it, then Mercury joins up with Saturn, then Venus. Quite a show still in store! The northern horizon as seen from Brisbane or Alice Springs around 4.00 am on Wednesday 13 August, the best time for us southern hemisphere types to see it. The stylized meteors are greatly exaggerated in brightness, they will be much dimmer than that. People living north of Brisbane or Alice Springs (eg Darwin) will get a much better view. 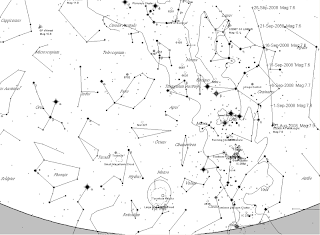 The Perseids are a reliable northern hemisphere meteor shower where observers may see about a meteor a minute. In the Australia, the point of origin of the shower lies very close to the horizon, below it if you are south of Brisbane. Thus we will see far fewer, possibly a meteor every 10 minutes or so (maybe one every 5 minutes in Darwin). Nonetheless, even though we see few meteors, the sight of the occasionally meteor streaking up form the horizon is fantastic. 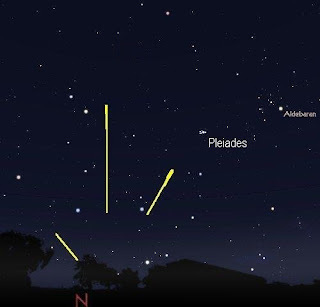 So if you rug up and go out between 3.00 am and 5.00 am and look to the north, you may see something nice (and the Pleiades and Hyades will be good to look at as well, and there is an ISS pass later in the morning). The western horizon at 6:20 pm ACST, as seen from Adelaide (actually Largs Bay beach). The Planetary dance continues, Mercury has now joined the lineup, it's just below Venus in the picture ... behind a cloud. Yeah, I know. But at least all 5 classic planets are now visible in the sky (if you have a low cloud free horizon that is). Still, things set exciting over the next few days. Mercury will get higher in the sky and brighter, approaching Venus and Saturn. Venus and Saturn get closer, being closest on teh 13th and 14th, with Mercury just below them. Then of the 15th and 16th, Mercury and Saturn pass each other. Then finally Venus and Mercury catch up with each other. So keep an eye on the early evening sky, there will be lots to see (if the weather doesn't mess us up that is). Typically, there are science Week related events before Science Week proper, like Science Alive! I've missed most of these (especially the astronomy stuff) by being discombobulated with work (don't ask) and food poisoning (really don't ask), but the Bettdeckererschnappenderweisle remembered Science Alive! and pushed us out the door. The boys responded enthusiastically (why do we have to go? Can't We stay home? I want to stay home!). But after the Magic Show, they warmed up to it (even though the outside was freezing). Soon they were controlling a robot, making slime and their own LED torch (left), plus solving 3D puzzles (above) and getting designer paper planes, so a good time was had by all in the end. There's a lot more coming in Science Week, so go along, there will be something for you! You get the picture. It has driven the bettdeckererschnappepndreweisle insane trying to get the washing in and out during the breif sunny patches. MiddleOnes soccer match was abandoned in a flurry of hail. Even though I have re-soldered the scopes battery connections, and power is restrored, I don't think I will be doing any observing in th near future. Carnival of Space #66 is here. Carnival of Space #66 is now in orbit at A Mars Odyssey. There is more on space based solar pwoer, perchlorate on Mars, a good selection of Space reading, astronomy and glaciers, and lots lots more! So fire your thrusters and head on over! If you are not watching the Olympics tomorrow night (Friday 8 August), living in or around Adelaide and want to know the facts behind climate change, then come along to the first in a series of free public seminars on climate change being given at Adelaide University. The seminar "Is the Earth really warming?" will be from 5:30pm to 7:00pm, Friday 8 August, Lecture Theatre 102, Napier Building, North Terrace Campus, University of Adelaide. Astronauts boldly stride forth, friendly aliens zip about and the Lunar Observatory keeps vigil. MiddleOne made this diorama just now, while waiting for me to finish the dishes. Now we are putting together a robot while watching the Olympic Soccer with EldestOne. Once again I am entering the City to Bay fun run. This year, ratcheting things up a notch, I'm going to run a whole 6 kilometres (Whoooo!!!). I promise to grimace comically as I stagger along in response to your generous donations (that's the comic grimacing, the staggering I can do on my own). We now return you to you astronomy programming. The Jodcast goes Video - check it out! Jodcast, the podcasts put out by the Jodrell Bank folks, have just started video webcasts. Check their first one out! The planetary lineup on Monday August 4. You will need to click on the image and enlarge it to get the full detail. As I mentioned in my Jupiter post, Monday started with rain, progressed to heavy rain, then continued with rain ... but cleared up on my way home. So walking back from the train I was treated to Venus above a pristine horizon, all washed clean. I didn't immediately rush out and photograph it, dinner was about to start as I walked in (one of the disadvantages of evening events is they clash with dinner, something you can't put off with young children), and I had to set the table. But after dinner I jogged up the "hill" to the beach to get these shots just before Venus disappeared. Magnificent! A perfect complement to Saturdays lineup, with the thinnest crescent Moon I have even seen. I had to jog back to get the dishes on, but I alerted my neighbour to the sight as he walked the new puppy. The sky was clear this evening, after pouring down rain most of the day, and leaving me soaked when going to give my lecture. But the evening twilight more than made up for the days dampness. Emboldened by the clear sky (you could see the Milky Way and the rifts in it), I set up my scope. Having let the scope cool down I set up the instrumentation, in the process ripping a wire from the battery pack of my time drive (yeah! soldering on the weekend!). Back on 22nd June Pluto passed in front of a fairly obscure star UCAC2 25370733 as seen from Australia. This is a fairly rare event (as well as being technically difficult), and Australian observers were excited about seeing it. Sadly, many locations were clouded out, but Dave Gee was able to record the occultation from the Blue Mountains near Sydney, and even made a movie of it. Go have a look! Steve Kerr also picked up the Pluto Occultation from Rockhampton. The start of the Planet Dance was last evening. Hughie was kind (although it poured rain on EdlestOnes soccer match) and the sky cleared in the evening so I could see the line-up. If you enlarge the image on the left by clicking it, you can see Mars, Saturn and Venus (Regulus is too dim to be seen in the thumbnail, but you can see it as the dot between Saturn and Venus on the full-size image). But where is the Moon? It's below Venus! But you can't see it! One thing I hadn't counted on was the thinness of the Moon, at only 22 hours past new and 10 degrees from the Sun the crescent was only 1.2% illuminated and stuck deep in the twilight. Although this is not the most extreme crescent Moon, it made it dashed hard to see, and near impossible to photograph. It's very likely many people missed the Moon altogether, and were standing around saying "what the heck was he talking about. There is no Moon?" In the image below you can see the crescent Moon as a faint line near the bottom left of the thumbnail. Click on the image to enlarge it to see it in more detail (such as it is). The Moon was relatively hard to see at civil twilight (30 minutes after Sunset), but once you were used to it it was fairly easy to watch. Photographing it was a real pain though. Not as much of a pain as trying to image the Moon 3hrs and 27 minutes before new. Catching extreme crescent Moons is a bit of a past time with some astronomers, you can see a list of records here. If you are interested in trying to see the thinnest crescent Moon, you will need a really flat, unobscured horizon (like the sea, or desert plains. It works even better if you are up a mountain overlooking a flat horizon). I have the sea for my western horizon (if I walk down the beach), so I might have a go. If you are interested in seeing really thin crescent moons this article gives you lots of hints, and Steve Saber publishes tables of timings of thin crescent Moons. He also has some handy hints on observing thin crescents. So why not have a go? Carnival of Space #65 is here. Carnival of Space #65 is now bobbing up at 21st Century Waves. You can find out why there are no green stars, why solar power satellites may be useful, science fiction for juveniles... oh, and there was that solar eclipse wasn't there. Surf on over and have a read. 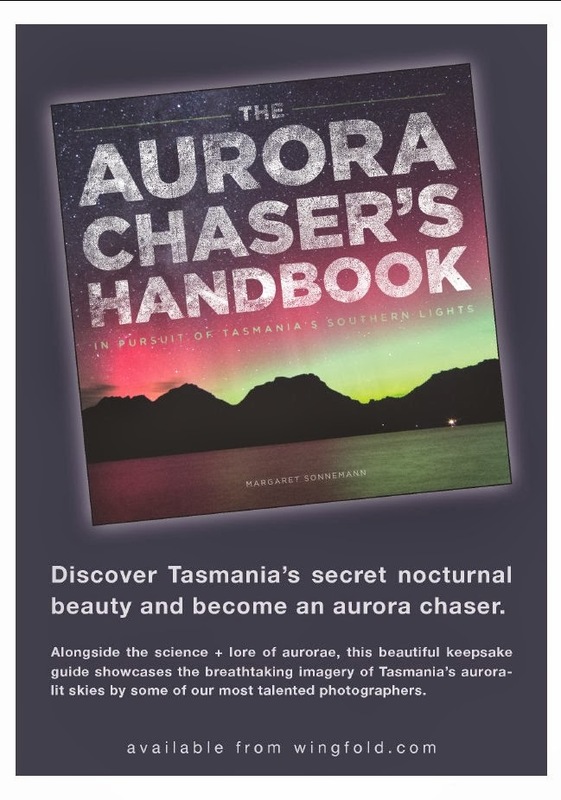 Southern Skywatch August edition is now up. The western horizon from Adelaide at 6:10 pm on August 2 (similar views will be seen elsewhere in the Southern Hemisphere at around half an hour after sunset). The August edition of Southern Skywatch is now up. We have an amazing Dance of the Planets, a partial Lunar eclipse, the Persiid meteor shower and more coming up this month.